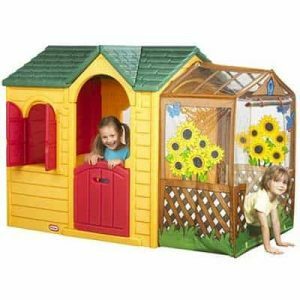 A fantastic classic playhouse with the addition of a ‘greenhouse’ on the side for extra enjoyment. This playhouse offers many opportunities for imaginative play and has a lovely, unique design that stands out from its competitors, both within the Little Tikes range and beyond. 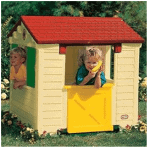 This is a great little playhouse ideal for children age 2+ and an affordable choice. Constructed from UV resistant plastic means it will never dull down and look great years down the line. In brightly coloured green and red with yellow trim, the children will love playing inside and outside giving them hours of enjoyment. There is even a little conservatory with sunflower design printed on the plastic sheeting – and the stable door and windows with shutters make hide and seek so much fun! We believe this to be a great playhouse which will set their imagination alight! This playhouse is also extremely easy to put together so the kids can be using it in a matter of minutes. 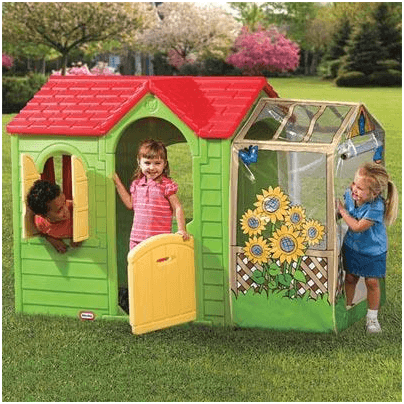 Overall, the actual house of this playhouse may be slightly smaller and more basic than other playhouses within the range but the fantastic ‘greenhouse’ add on to the side makes a wonderful and unique addition that will provide many hours of fun. 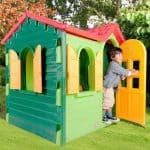 Little Tikes Garden cottage playhouse: How safe is it? 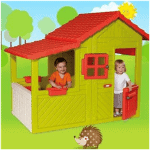 The Little Tikes playhouse range is well known for its sturdy and chunky designs, great for small children and even smaller fingers. This playhouse is no exception, however with the unique addition of a ‘greenhouse’ it is constructed of slightly different materials. The question is does this pose and safety issues you should be aware of? We discuss any safety concerns that parents or carers may have concerning this product below. Windows: This playhouse has charming shutter windows for children to enjoy opening and closing to see who is outside. These come with the same finger inserts that all the playhouse in the Little Tikes display. Once your child knows to use these inserts to operate the windows, trapped fingers are no longer a concern. Door: The stable door is a fantastic addition that can be opened from above or using the central handle, thus preventing trapped fingers becoming an issue. The doorframe itself is high and will accommodate even the tallest child within this age range, so bumped heads will not be a problem. 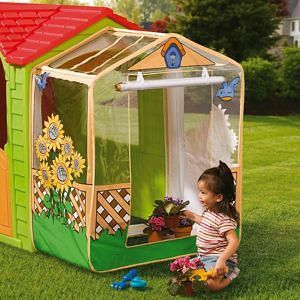 Greenhouse: Although a fantastic and interesting addition to this playhouse, the greenhouse is not made from the same plastic as the main house. It is made of slightly flimsier plastic so it appears more like a greenhouse. Although not as strong as the thick plastic used for the house construction, it doesn’t pose a safety issue for small children. The only minor issue to be aware of is that to exit the greenhouse there is a strip of plastic to step over, so it is best to make your child aware of this so they do not trip and fall through not realising it is there. Little Tikes Garden cottage playhouse: How easy to build? As with all Little Tikes playhouses, this playhouse uses the easy click and build technology, making assembly of this house a dream. For even the parent who is terrified of building anything using a manual, this is a no-panic solution. With no tools required, simply click all the pieces into place to form the basis of your main house. Next, the ‘greenhouse’ simply clips on and there you go, a fully built house for your little one in next to no time at all. 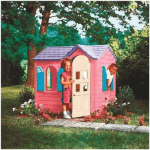 Little Tikes Garden cottage playhouse: What is the overall quality like? The Little Tikes playhouse range sits highly in our estimations, but is this house as good as the rest? Of course it is! 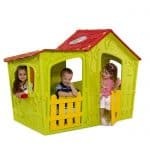 This is a fantastic playhouse with all the qualities that we have come to expect from the Little Tikes range. Strong, sturdy plastic that will stand the test of time and UV resistant too means that the vibrant colours will still be looking great in many years to come. In regards to the ‘greenhouse’ addition to the main playhouse, some reviewers have said that they think and have experienced this being not as long lasting as the rest of the house. This is most likely naturally expected by anyone looking at the product at a glance. The plastic sheeting may be prone to tear if it is played with in rough and tumble childhood situations, however it is not so delicate that it isn’t suitable for purpose or to be played with by pre-school children. Our final thoughts on this playhouse are that this is a fantastic, unique design that will endure many days of fun. The flexibility and fun factor that the house has to offer definitely makes sure that it deserves its mid-range price. However, if the ‘greenhouse’ becoming damaged is of concern to you then another playhouse within the Little Tikes range may be more suited to your needs. Overall I was impressed with this playhouse, except for how long it lasts. The price is not too bad but could be lower because of how small it is and the time period that it lasts. However, I think for what I needed it for, it was a good enough purchase. I know my children will just outgrow this playhouse anyway. I absolutely love the fact that it is UV resistant plastic. Definitely for 2+ years old for this playhouse. My children like that it comes with windows and a door. The greenhouse look of this playhouse is beautiful. My kids like to pretend they own their own greenhouse sometimes. This was the most darling thing I came across. My daughter is never bored anymore. We got this for her so she can play with her little mates and wear herself out. This has been the result for sure and we couldn’t be happier. There are a few things worth mentioning. It is pricy for what you get and as far as it lasting years, well that may be a challenge. The conservatory bit on the end is bit flimsy so children with a heavier hand is going to tear that apart in a short while. We already had a puncture incident. If you want it to last a bit longer make sure they aren’t trying to push little toys through the clear plastic. I have been looking all around for a plastic playhouse for my 2 girls. They love being outdoors and they liked playing in our neighbor’s playhouse. I knew I just had to get my children one. Once I saw this one, I knew I had to get them it. It was girly and they love things like that. I loved the way the door way was, and they loved to run through it. My wife and I like to see our children active, because it is good for them. We didn’t have to worry about them not getting their energy out with this. They definitely got all of their energy out with the playhouse and by the time they were done, they were ready to eat dinner and go to bed. I love the way this is built. It is not dangerous at all and I feel comfortable with my kids playing in there for hours at a time. I am a first time parent and I’m always cautious about buying my child toys that could be dangerous. I found the Little Tikes playhouse after a friend told me about the site. I purchased and I am very pleased with the product. I is made of durable plastic that will last for good length of time. I would recommend this playhouse to anyone with small kids. My son has had a lot of enjoyable moments with it. I received home delivery and the company also treats the customer like a customer should be treated. I think I am about to purchase this because of all the wonderful reviews. It seems like so many people are happy with it. It is my daughter’s birthday in a few weeks and I am going to surprise her with this. Thanks everyone for leaving your feedback! It helps people out like me. Hi, the best bet is to contact the maker of the product. The issue you will have is they are likely not to stock something for a relatively cheap product like this.